No matter what your kitchen's style, some coffee-themed kitchen décor can be a fun way to show your passion for this hot beverage. From vintage signs to wall stencils, there are many ways to add some coffee themes to your kitchen. Your kitchen's style and a decorative theme may not be thought up at the same time. Frequently, the style of the kitchen, whether it's modern, country or Italian is done long before a decorative theme is put into place. The theme of the kitchen, such as coffee-themed kitchen décor, can be added at any time and should work with the overarching style of the kitchen. Colors should be harmonious, and the theme should complement, rather than compete with the rest of the space. If you've chosen to carry your passion for coffee through the theme of the kitchen, begin by identifying your kitchen's style and color palette. These two elements will come into play as you select the various pieces of coffee-themed décor for the space. If your kitchen is contemporary in style, complement it with frameless, black and white prints of coffee beans and equipment. The grayscale of the prints will show off any stainless accents in the kitchen, while allowing any pops of color already in place to remain dramatic. The lack of a frame will help to keep the theme minimal. Finish off the look with stainless steel espresso equipment displayed on shelves and sleek, modern coffee cups in a bright color for additional interest. Add some coffee-themed style to your country kitchen with a stenciled wall border of coffee cups and beans. Choose matte colors and use a sponge to apply the paint to blend the border in with the rest of the kitchen's décor. Handmade coffee cups in an array of colors can be scattered around the kitchen on shelves or hooks to add some color and texture to the room. If you have a retro or vintage theme in your kitchen, you'll find plenty of vintage inspired prints and art work to decorate with. 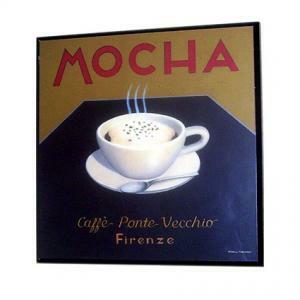 Use a cluster of vintage coffee signs on the wall near the kitchen table for a welcoming look while larger posters are located near the entrance to the kitchen. Finish off the design with light switch covers done in a vintage coffee print to give just the right finishing touch to the design. If you have an eclectic kitchen full of color and interest, look for fun art prints with coffee pots as the center focus for the walls. Colorful Fiestaware coffee pots and cups can be displayed in china cabinets or on top of cupboards to add to the colorful theme of the room. 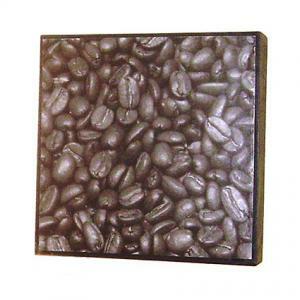 Consider adding art tiles to the kitchen backsplash with a coffee theme as well. Art tiles done in bright blues, yellows and reds with black, white and brown coffee prints in the center can add a fun focal point to the room. No matter what style of kitchen, coffee-themed kitchen décor will always fit in. If you aren't sure how a specific style will work, start slowly and add pieces a little at a time. 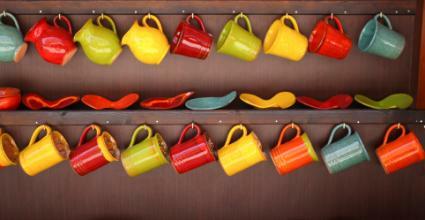 Add wall prints one by one and collect themed coffee cups or pots to display from a variety of sources. Over time you'll discover what style fits in best with your kitchen and you can complete the look. Add some coffee-themed décor to your kitchen and instantly add depth, character and a personal touch to the space.